Factorial design was used to investigate the contribution effect of cooling rate of stage between rolling and coiling and cooling rate after coiling on grain size, pearlite lamellar spacing, mechanical properties and hardness of hot rolled narrow 65Mn strip. 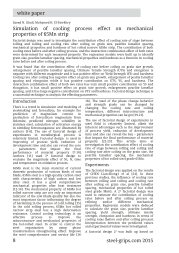 The contribution of both cooling rates before and after coiling process, and the interaction combination effect of both rates were determined for each measured property. The regression models were built up to identify grain size, pearlite lamellar spacing, mechanical properties and hardness as a function in cooling rates before and after coiling process. It was found that the contribution effect of cooling rate before coiling on grain size growth, enlargement of pearlite lamellar spacing, Ultimate Tensile Strength (UTS) and elongation is negative with different magnitude and it has positive effect on Yield Strength (YS) and hardness. Cooling rate after coiling has negative effect on grain size growth, enlargement of pealite lamellar spacing and elongation while it has positive contribution on UTS, YS, and hardness. The interaction combination effect of both two rates has very small positive contribution on YS and elongation, it has small positive effect on grain size growth, enlargement pearlite lamellar spacing, and it has large negative contribution on UTS and hardness. Factorial design technique is a successful technique to analysis the effecting parameters. This work aims at studying the change in constituent phases of High Manganese High Aluminum content steel through isothermal ageing and their effect on the plastic behavior of the produced steels. Optical and scanning electron microscope were employed for observing the significant change in microstructure at different heat treatment regime. XRD was applied to detect the major phases after isothermal process. Three samples with different phase consitituents were subjected to compression test. The results refer to the decomposition of γ-austenite into β-phase (B2, DO3), β-Mn, K-carbide is widely changed as a result of isothermal ageing process. The plastic behavior and strain-hardening property are improved linearly with k-carbide fraction. A bit enhancement of hardness has been observed with increasing k-carbide fraction after isothermal ageing process. In virtual design of hot stamping, the reliable description of the material flow behaviour is an important input to ensure accurate estimations of the final shapes of parts. Currently, to characterise the hot stamping material’s flow behaviour at elevated temperatures, tensile and upsetting tests are available. 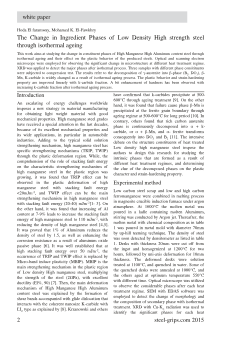 The focus of this article is on the determination of the flow curves of manganese-boron steel at elevated temperatures based on upsetting tests. The measurement of material flow properties directly out of the upsetting tests still remains a complex task due to its non-uniaxial nature. Therefore, traditional methods to calculate flow curves out of such measurements are not necessarily appropriate. It requires a method which considers multi-axial stress states as well as non-uniform strain evolution. In that way the calculation of the flow curves is appropriate and it can provide reliable input for simulations of hot stamping. In order to interpret measurements and deduce flow properties more precisely, simulations using Finite Element Method (FEM) of the tests themselves are executed. Indeed in FE-models it is possible to account for complex boundary conditions such as non-uniform temperature fields, non-uniaxial stress states and friction between upsetting die and the specimen during the deformation. With use of inverse optimisation, based on the final geometry of the deformed specimen, Coulomb’s friction coefficient is estimated. It is demonstrated that an almost constant value of the friction coefficient is achieved, even after using many different types of strain hardening to describe the material behaviour in the FE-models. Finally, it is demonstrated that the deduced material flow curves with use of inverse optimisation are more accurate than that of the directly calculated out of experimental results. The H2/CO ratio in the reducing gas is one of the most important factors that affect the reduction rate of iron ore pellets in the direct reduction processes. The present study is focusing on the effect of H2/CO gas ratio on kinetics of direct reduction of iron ore pellets. The H2/CO ratio was in the range of 1.0-2.6 which simulates the reducing gas composition in different direct reduction technologies (Midrex, HyL, and Syngas based direct reduction). The reaction rate constants and the apparent activation energy of the reduction process were calculated for both of the experimental and mathematical regression model. The unreacted core shrinkage mathematical formulations are applied to determine the rate controlling mechanism. The highest regressions and the lowest deviations from straight lines were obtained by the application of the mathematical formulations that corresponded to the interfacial chemical reaction mechanism and mixed control of chemical reaction with gaseous diffusion mechanism. The comparison between the calculated apparent activation energy and the standard ranges indicated that the rate controlling mechanism is mixed of the interfacial chemical reaction and gaseous diffusion. The contribution of chemical reaction in the rate controlling mechanism increased as the H2/CO ratio increased. The reaction rate constants and the apparent activation energy values were found to increase as H2/CO ratio increased due to the higher diffusivity of H2 compared to that of CO gas. High strength medium carbon austenitic stainless steels have been developed through partial and total replacement of nickel by nitrogen. Stainless steels containing 0.4% carbon with different combinations of nickel and nitrogen were produced in 10kg induction furnace under different nitrogen pressures. The produced stainless steels were cast and hot forged and the total nitrogen was determined. Furthermore, the produced forged steels were subjected to either only solution treatment or solution treatment followed by ageing process. Nonmetallic inclusions such as carbides and nitrides were separated by electrolytic dissolution. Nitrogen as nitrides was determined and soluble nitrogen was calculated. XRD technique was used to investigate the types of nonmetallic inclusions. The microstructure of produced stainless steels was observed and the grain size was measured. The tensile properties at room temperature were determined. The influence of grain size, total nitrogen, insoluble and soluble nitrogen on tensile strength was investigated. All produced stainless steels as-quenched were aged at temperatures range from 450°C to 950°C for different times. Hardness test was carried out for aged stainless steels and the optimum ageing conditions were determined. After solution treatment of the investigated stainless steels at 1050°C, a great portion of alloy carbides and nitrides is observed to be taken into solution. Nitrogen in solid solution increases both yield and tensile strengths. At optimum ageing temperature, this portion in solution precipitates, mainly as Cr2N, was causing higher precipitation strengthening. The yield strength and ultimate tensile strength of the aged stainless steels were found to increase at average rates of 706 MPa/1 mass % nitrogen and 723 MPa/1 mass % nitrogen, respectively. On the other hand, the increase of nitrogen content deteriorates the steel ductility.